Quasar Marijuana by Buddha Seeds is a feminized strain known by many as "the perfect hybrid". It gives great productions and offers an euphoric and ultra-potent high being able to satisfy regular smokers and commercial growers. 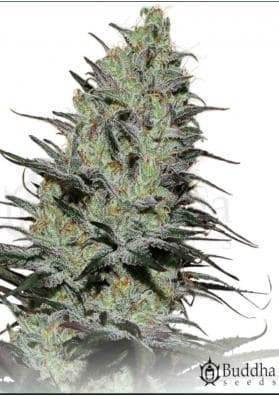 Quasar is a feminized strain of Marijuana known by many as "the perfect hybrid", that was developed by mixing genetics of a back-crossed Sativa and a good Indica strain. It retains the best of every Marijuana features having high power, great yields and a strong growth. The effect is very potent, euphoric but nervousness with a soothing touch that stabilizes the high. Quasar develops in a plant with a very strong growth becoming a huge plant in the outside while in the inside its growth is able to reduce the total cultivation time. It also has a tough and sturdy structure, capable of sustaining the very dense and compact buds. It will be ready for harvesting in about 65 days in indoors.